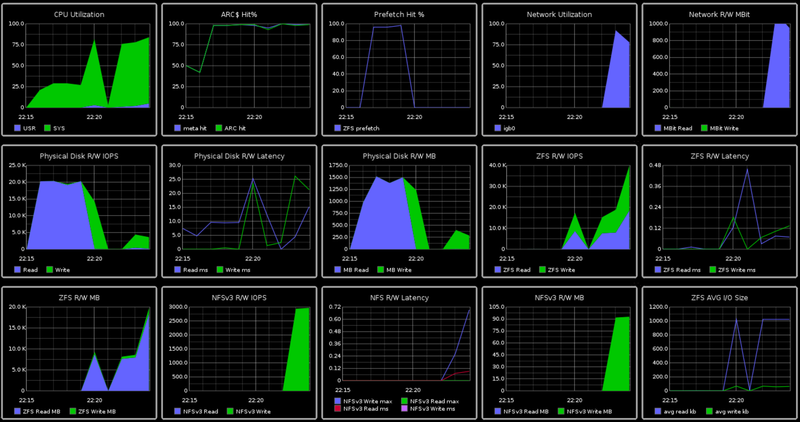 While woking with ZFS performance I created a dashboard to get a good overview with lots of different statistics. It's powered by Dtrace, python and graphite. There is a high level of detail but still easy to correlate different statistics. You get a good view of how the layers interact, the latency for reads in ZFS compared to reads in from the physical disks, average latency, maximum latency, average read size and see how much more data ZFS reads form prefetch including hit rate etc. I based this on the iomon dtrace script with some glue to send it into graphite, I also added ARC statistics and CPU/Network statistics. ( There is a iomon-graphite effort available on the web but that did not give me correct statistics and did not include things like CPU and network utilization ). Looks fantastic. Is this all point in time or does it do historical too? Thanks. It is historical data also, graphite keeps all data and allow you define range.